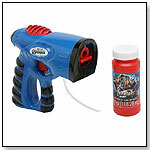 Each Licensed Bubble Blaster creates streams of continuous bubble action for hours. Includes Super Miracle Bubbles Premium Plus Solution in 100% recyclable bottle. KAOS Nemesis reinvents the traditional water balloon fight by taking it to a whole new dynamic level of “getting soaked.” Kids and adults can kick-up the level of insanity with an extreme water balloon fight. Each KAOS Nemesis launcher is designed to comfortably launch water balloons up to 100ft with a simple flick of the wrist. The KAOS Nemesis has a large scoop top for quick reloads and comes with 25 Balloons. The new Super Miracle Bubbles Bubble Turbine is guaranteed to provide kids and adults with the seamless ability to create humongous bubbles and a variety of spectacular bubble tricks. 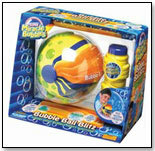 Includes Instructional Booklet and Super Miracle Bubbles Premium Plus Solution in 100% recyclable bottle. Little Pop Stars will have hours of rockin’ fun as they bling while they sing with the Glammerati LumeFX Megastar Microphone. The Glammerati LumeFX Megastar Microphone includes an amplifier and features 3 KIDZ BOP hit songs. Every pop star will surely shine as the light up handle sparkles for every magical performance, whether it’s with friends, mom and dad, or just practicing alone in front of the bedroom mirror. The built in crowd cheers will boost confidence and the record and play back feature sets the tone for the making of a superstar. Launch date: Summer 2012. Kids will have hours of star strumming fun and feel like a real Pop Star with the Glammerati Electric Guitar. With its sleek modern look and feel and special glitter effects, this glammed out guitar will deliver a full pop star experience. The Glammerati Electric Guitar features 3 KIDZ BOP hits with additional built in keyboard, drums and bass sounds. Pop stars will fashionably take the stage with the groovy guitar strap, wireless headphone microphone and totally rock out with the life-like guitar strings that are extended down the entire guitar and play real music. Includes an “All Access VIP Credential,” lanyard, and two concert tickets. Launch date: Summer 2012. Googly Giggler is available in four different personalities. When one shakes him, he bounces, wiggles and sings a wacky tune. Launch date: June 2008. 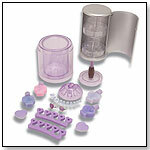 The set includes toe separators, four bottles of nail polish, one set of nails, two rings and two nail files. All are organized neatly in a 12” easy-to-transport nail polish-shaped case. Varieties are available in pink, purple and blue. Launch date: February 2007. The box includes eight glitter lip glosses, five tubes of lipstick, one tube of glitter lip gloss, three glitter eye shadows and a dual applicator blush. Varieties are available in pink, purple and blue. Launch date: February 2007. From the popular Nickelodeon cartoon “Dora the Explorer” come these new collectible finger puppets. Based on characters from the show, including Dora, Boots and Swiper, each puppet comes with a background card and child-sized ring. These puppets are part of a new Nickelodeon collection that Imperial Toys promises will also feature Diego, SpongeBob SquarePants and The Backyardigans. Launch date: Fall 2007. From the popular Nickelodeon cartoon “Diego” comes the Diego Rescue View Finder. Kids just insert an animal fact card into the top of the screen and scroll through the different environments to find the right match. The view finder comes with five animal fact cards. It is part of a new Nickelodeon collection that Imperial Toys promises will also feature Dora the Explorer, SpongeBob SquarePants and The Backyardigans. — “Ravensburger adult puzzles – we sell four or five a day,” Scott Sloan, manager of Toys Inc. in Myrtle Beach, S.C. told TDmonthly. — “We sell a lot of Ravensburger [puzzles] for adults. At least a dozen every day,” Pam Horwitz, manager of Mr. Toad’s Toy Company in Naples, Fl., told TDmonthly. — Four of 45 retailers surveyed by TDmonthly named Ravensburger adult puzzles as their best-selling puzzles. 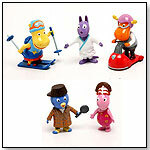 From the popular Nickelodeon cartoon “The Backyardigans” come these new collectible wind-up toys. Based on characters from the show, the collection includes Pablo, Tyrone, Uniqua, Austin and Tasha. Kids can wind them up and watch them go. These toys are part of a new Nickelodeon collection that Imperial Toys notes will include more than 50 different collectibles. Launch date: Fall 2007. This stretchy jaguar is designed to have a realistic feel. It comes with a bonus animal rescue card. Launch date: July 2007. This stretchy caiman lizard is designed to have a realistic feel. It comes with a bonus animal rescue card. Launch date: July 2007. This stretchy howler is designed to have a realistic feel. It comes with a bonus animal rescue card. Launch date: July 2007. With this product, kids can pour in special hair mix and watch SpongeBob grow a ‘do. Launch date: July 2007. Kids can blow up this SpongeBob character and make him bob. Launch date: July 2007. This Nick Jr. Dora the Explorer product connects to a regular garden hose and features two water splashin’ sprinklers. Dora spins 360 degrees with water-spraying action so that little ones can enjoy the fun. This Nick Jr. product connects to a regular garden hose and features a surfing spray sprinkler. Pablo of “The Backyardigans” spins full circles with water-spraying action so that little ones can enjoy outdoor fun. This Nick Jr. Go! Diego Go! product connects to a regular garden hose and features a rooster tail sprinkler. Diego spins around with water-spraying action so that little ones can enjoy the fun. Suitable for ages 18 months and up, this giant 88” beach ball combines fast and fun beach ball action with wild water play. 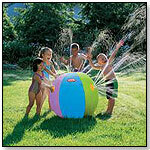 Once it’s inflated and hooked up to a garden hose, kids can roll it around for fun outdoor play. It can also serve as a stationary sprinkler when the bottom pouch is filled with water. This wet-and-wild ring toss game includes a 36” x 36” Star Splash vinyl sprinkler and five Star Rings so that little girls can help Dora catch the stars. This hand-held bubble party machine provides an endless stream of bubbles, allowing children to make thousands of bubbles in just minutes. Kids just pull the handle of the battery-operated ball to see it work. 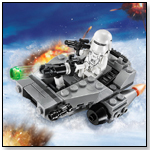 It comes with Super Miracle Bubbles solution and requires four AA batteries (not included). Children can take SpongeBob and his pal Patrick Hula Bobbles (sold separately) along for under-the-sea and on-land adventures. The 4" figurines are great for play and display, and are articulated at the waist for tons of silly hula bobble fun. They also feature a suction cup base for hula action on the go. Launch date: February 2007. — "We really don't deal with licensed products. I suppose SpongeBob might be one for us," said Kim Duff, manager at Giggles Toys & More in Bozeman, Mont. — "We might sell about six a month,” Duff noted in spring 2007. — "The Hula Bobble captures the essence and humor of SpongeBob. It's fun and comes to life anywhere, partly because it has a suction cup on the bottom for grip on various surfaces,” Tim Thompson, vice-president of marketing with Imperial Toy, told TDmonthly. Bubble Countin’ Chompers use new bubble play technology not to blow bubbles, but to eat them. The four assorted Chompers, Baby Bub, Pop, Ed and Melvin, count to 50, say five funny things, giggle and burp as they eat bubbles once their bellies are pressed. Each Chomper comes with a 4-fl. oz. bubble bottle and a bubble wand in a “try me” package. The lipstick set comes in a 12" lipstick-shaped case. Fitted neatly inside is an eight-glitter lip gloss pallet, five glitter lip gloss tubes, a tube of lipstick, two applicators and a mirror. Pink, purple and blue varieties are available. Launch date: February 2007. · Hello Kitty – a cat on life support? · Are Fashion Dolls Old Hat? Copyright © 2016 TDmonthly®, a division of TOYDIRECTORY.com®, Inc.